SAN FRANCISCO – October 21, 2014 – Embarcadero Technologies, a leading provider of software solutions for application and database development, has launched a time limited Upgrade Program, which runs until November 21, 2014. The new program is designed to enable any licence holder of XE or previous versions of RAD Studio, Delphi and C++ Builder to cost-effectively upgrade to the current XE7 version, enabling them to refresh older Windows based solutions with the new technologies such as Parallelization, Mobile and Wearable Extensions, Custom and Modern Windows 10 UI Styling, and the ability to offer iOS, Android, and Mac editions, and more. 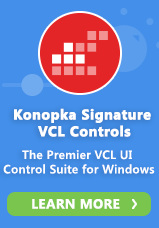 "There is no better time than now for Windows VCL application developers to upgrade and modernize older Windows based solutions to drive new sales, upgrade older customers, and expand their businesses with new product options and extensions. XE7 makes it almost point and click simple to update and extend older VCL apps with new capabilities, looks, and performance. We are committed to delivering the technologies and tools our customers need to succeed and take advantage of new opportunities in the market. This Upgrade Program discount makes all the latest technologies accessible to more of our Windows developers," says Michael Swindell, Senior Vice President of Products at Embarcadero. Automatic enrollment in Embarcadero's Recharge Program which enables program participants to receive each consecutive version at a significant discount (more than 50% off the typical upgrade price). The latest release of RAD Studio provides a complete solution to build connected apps for Windows, Android, iOS, OS X, gadgets, and wearables. The new XE7 version of RAD Studio enables Delphi/Object Pascal and C++ developers to extend existing Windows applications and build new, modern apps that connect desktop and mobile devices with gadgets, cloud services, and enterprise data and APIs. Additional information on this offer is available on the RAD Studio product page. RAD Studio XE7, Delphi XE7 and C++Builder XE7 are available immediately from Embarcadero and its partners. Visit the Embarcadero online store at store.embarcadero.com/ for pricing. To download a free trial, visitwww.embarcadero.com/products/rad-studio/downloads.